Wind and rain couldn’t keep us away from today’s Burst Into Song and Dance event. For weeks, a core team of performers (headed up by the dangerous duo, Nicole and Dirk) have been practicing their roles for the Adelaide Flashmob’s own rendition of “Little Town” from the Disney classic, Beauty and the Beast. Today, their hard work paid off as they were joined by a small band of extra flashmobbers for a brilliant performance that would draw in huge crowd of Christmas shoppers at Rundle Mall. At 2:30pm, a lone singer stood in the Gawler Place canopy to sing a chorus of “Oh Holy Night.” Just as she hit her high note, she was rudely interrupted by the over-head speakers playing a completely different song. As the song played, a young lady in a blue dress stepped out from the hustle and bustle of Sunday Christmas shoppers and launched into “Little Town.” As the song progressed, more and more of the ‘shoppers’ joined in with their parts until the single singer was joined by a full chorus line of singers and dancers! Everyone played their parts perfectly. Even the people who had only learnt the song two hours earlier, were spot on (for many of them, it was their first flashmob!). As suddenly as the performance started, it ended. 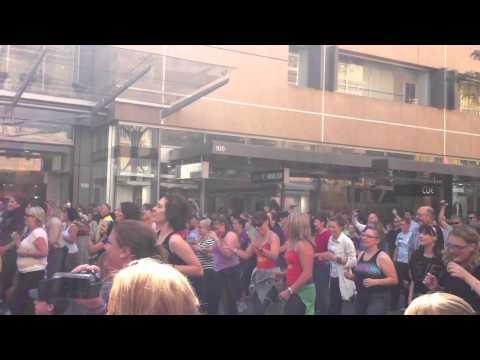 The music ended, the flashmobbers dispersed, and the Sunday shoppers were once again entertained by the antics of the Adelaide Flashmob. « Burst Into Song This Sunday!